We recently ate at Scott Conant’s ode to Italian fine dining, Scarpetta, and although neither of us are fully on board with true serving and a half sized vegetarian spaghetti for $23 a plate, it was damn tasty nonetheless. We went into the dinner wanting to find fault, too, since Conant can come off as bristly and derisive to say the least when he judges on Chopped (one of our favorite shows). See our full Scarpetta review on Foodie In Miami . So, we ate there, and predictably fell in love with the pasta sauce (it seems everyone has the same reaction to this sauce, too). And, in a providential all-things-are-connected-on-the-Internet twist, it just so happens Deb & Alex from Smitten Kitchen had recently visited Conant’s NYC location and determined the very same thing at nearly the same time. We (mostly) followed their recipe for this first foray, and found it a worthy sauce, but not quite up to the Scarpetta standard. Something is missing, and I can’t quite put my finger on it just yet. I’m sure the restaurant uses more butter than we did, and maybe that’s all it takes to get the velvety creaminess they achieved. I can’t help but think there was a wallop of cream hidden in there somewhere, though. We shall see in future iterations. A note on pasta: We used bucatini, a spaghetti-shaped pasta with a hole in the middle and cooked it to just barley al dente. Conant would approve. The bucatini holds up perfectly with its little hole, which holds small bits of saucy goodness for extra taste with every bite. 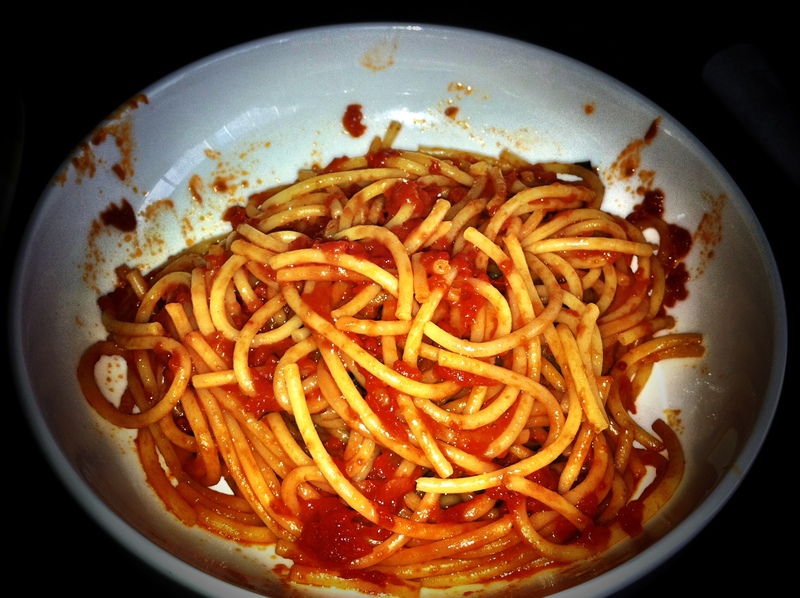 If you cannot find bucatini, you can certainly use spaghetti, but I would lean more toward using something with some ridges or a hole so the sauce can cling to each and every bite. Pour the tomatoes and salt into pot (large enough to accommodate the tomatoes with some room left over to toss the pasta) over medium-high heat. With a potato masher, break the tomatoes down until you reach the desired consistency. For us, that was somewhat chunky but mostly on the smooth side. Bring up to a boil, then knock the heat back until the pot is just barely simmering. Gently simmer 35-45 minutes, adding a splash of water if things look too dry in the pan. While your pot is simmering away, combine the garlic, red pepper flakes, olive oil and about half of the basil in a small pan over the lowest heat setting. Gently bring the oil up to a simmer (don’t raise the heat), and strain into a small dish. Set aside. After the sauce has been simmering about 25 minutes, bring a large pot of water to a boil. Add a palm full of salt. Add the pasta and cook until al dente (when it’s still firm to the tooth, aka could use another minute or two on the heat) and drain, reserving half a cup of the pasta water. Once the sauce reaches the consistency you like, stir in the olive oil and adjust seasonings to taste. Add the pasta along with half the pasta water to the sauce and toss together, cooking for another minute or so. If things look dry, add the rest of the pasta water. Add the butter and remaining basil; serve immediately.